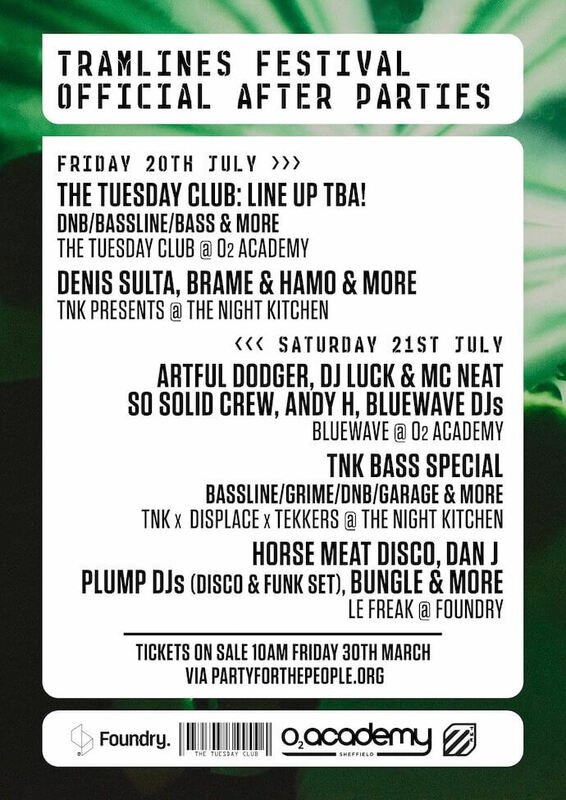 5 official after parties have been announced for Tramlines Festival, with Denis Sulta, So Solid Crew and Horse Meat Disco amongst the names. This follows the release of the bill for the weekend’s main headliners at their new home of Hillsborough Park, which includes Noel Gallagher’s High Flying Birds, Stereophonics and Craig David. With the O2 Academy, Foundry and Fusion and the Night Kitchen all in use, it’s sure to be one well of a weekend of nightlife, not to mention all the off-Tramlines events yet to be announced. Tickets for the after parties go live this Friday at 10am. Alongside TTC’s TBA Friday night is recent Essential Mix star Denis Sulta, who has rocketed to fame with his trance inspired euphoric house and disco edits. Saturday sees garage legends Artful Dodger head up a bill of nostalgia at Bluewave’s O2 special, while Horse Meat Disco return to Foundry with Plump DJs. Tickets for the after parties go live this Friday at 10am here. For a full nightlife listings, head to exposedmagazine.co.uk/listings-homepage. Pete McKee: "I want to show there’s a huge amount of nobility in being working class"